There are a variety of ways to produce tissue and towel products from wood-based fiber furnishes. These may include the use of primary (or virgin) fiber produced with conventional chemical pulp processes, such as bleached hardwood and softwood kraft pulp, as well as recycled fibers (RCF) that are produced via the processing of recovered paper. Recycled fibers or RCF today make up around 35% of the total fibers going into tissue making, worldwide. In fact demand for recycled wood fibers is presently so great that essentially all recycled fibers that can be used, are being used. Wood fibers are naturally degraded after they are recycled 3-5 times, so therefore new primary fibers must always be coming into the system. This paper will look at the various aspects that must be considered when designing a RCF processing system, and also present typical equipment, layouts, and configurations used in modern RCF lines for tissue. 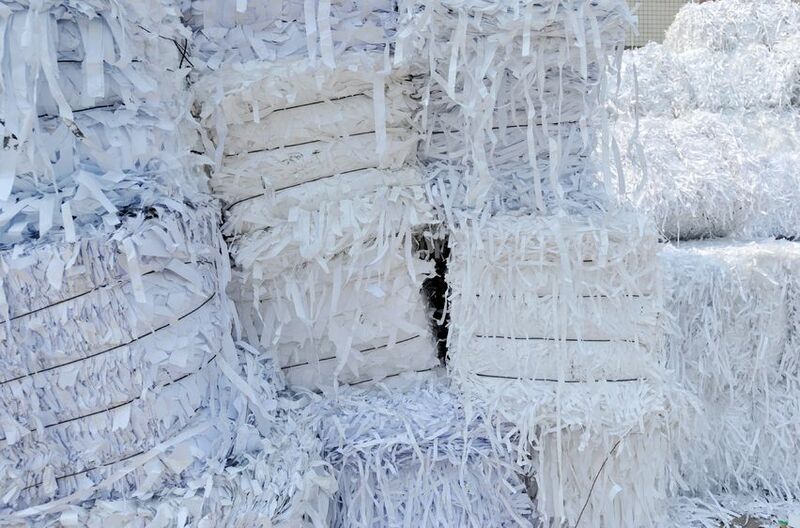 Irrespective of the desired production parameters, it can be generally said that the paper recycling “process” is one of removing various contaminants (including debris, ash, fines, inks, sticky glues and waxes, etc) to get the wood fibers, which are ideally fairly intact and white in color. The equipment and unit operations used to accomplish this are quite similar to others that are commonly applied in other pulp and paper processes. 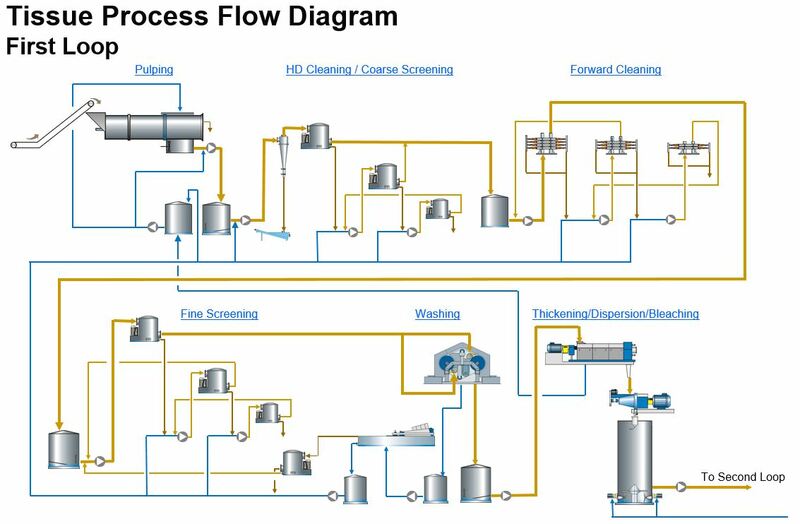 These unit operations in the recycle process are configured a variety of different ways depending upon the above parameters, and are generally are comprised of a two-loop (= 2 separate water loops) deinking process generally in accordance with the attached flowsheets illustrated in Figures 1 and 2. The operations are described in the text that follows. Pulping (and Detrashing): In the Pulping process the various wastepaper furnishes are combined with water and “pulped” into a homogenous mixture for further processing. Typically, high-consistency pulpers are used for this purpose and either Drum Pulpers (continuous) or Tub/Vat Pulpers (batch) are used with the objective being to defiber the waste paper into individual fibers, remove gross contaminants and stickies, and detach the ink from the fibers so the ink can be removed later in the process. High-Density Cleaning: Larger-diameter cleaners are used to remove large, heavy weight contaminants (staples, glass, etc) while minimizing good fiber loss. Coarse Screening Process: Conventional pressure screens, fitted with holed or slotted baskets, are used to remove medium-sized debris and plastics. Additional deflaking (= breaking undefibered flakes into individual fibers) is also accomplished while minimizing good fiber loss. Forward Cleaning: Smaller-diameter cleaners are used to remove heavy-weight debris (eg: sand and dirt) and some inks. Fine Screens: Conventional pressure screens, using slotted baskets, are used to remove stickies such as clues, adhesives, waxes and plastics, as well as other smaller debris. Washing: High-speed belt washers, or drum-style washers, are used to remove ink, ash, and fines while increasing brightness and providing pre-thickening (8-10% with belt washer) before the Screw Press. Pressing/Thickening: Screw presses or Twin Wire Presses thicken the stock to around 30% for optimum dispersion. Some fines and stickies removal is also accomplished here. Dispersion: Disc dispergers or Kneaders using screws reduce the size of ink/dirt/stickies particles to allow for easy removal later in the process. Additionally, steam and bleaching chemicals are also added just before, or directly into, the disperger to take advantage of the high-consistency operation. Bleaching: A high (or sometimes medium) consistency bleach tower often follows the high-consistency dispersion system to provide the retention time needed to drive the bleaching reaction to completion to whiten and brighten the pulp. Flotation: Flotation cells, which allow the injection of air to generate optimal bubble size formation to enable the separation of detached ink from fibers, remove additional ink and ash subsequently providing a further brightness increase. 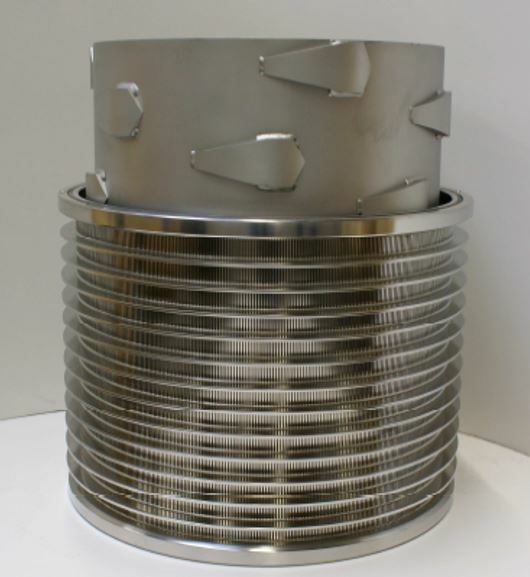 Thickening: A Disc filter is typically used to provide a final thickening to 8-10% solids before storage. This also provides a “water block” which prevents carryover, thus separating the recycle water system from the papermachine water system. Water Clarification: Irrespective of which recycle system configuration is used, all plants will incorporate Water Clarification to some extent. Using Clarifiers (typically one or two depending upon the system design), certain waste streams are routed to the Clarifiers, solids are removed and sent to further processing (pressing, burning, landfill, etc), while the clean filtrate is typically re-used in the recycle plant. 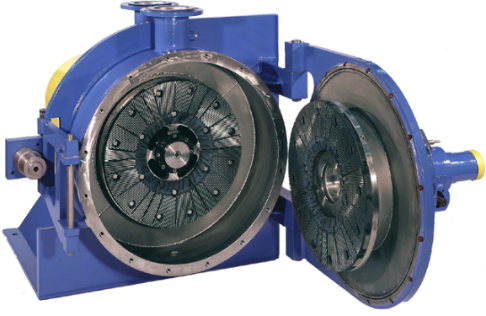 Sludge Presses: Screw Presses or Belt Filter Presses are typically used to thicken sludge from the Clarifier, prior to further processing such as burning, landfill, etc). Bleaching: A reductive bleaching stage, for color-stripping, may be utilized especially if the first bleaching stage is oxidative only. Other bleaching strategies such as sodium borohydride, etc., may also be used and would therefore impact bleaching system design. Thickening: A Screw Press, to achieve 30% consistency, may be added as a final unit operation to provide a more effective “water block” separating the recycle plant from the papermachine. Lightweight/Reverse/Combination Cleaners: Some recycle plants utilize a Lightweight or Reverse Cleaners, or as part of a special Forward/Reverse Combination Cleaner to further remove lightweight contaminants like waxes, etc. 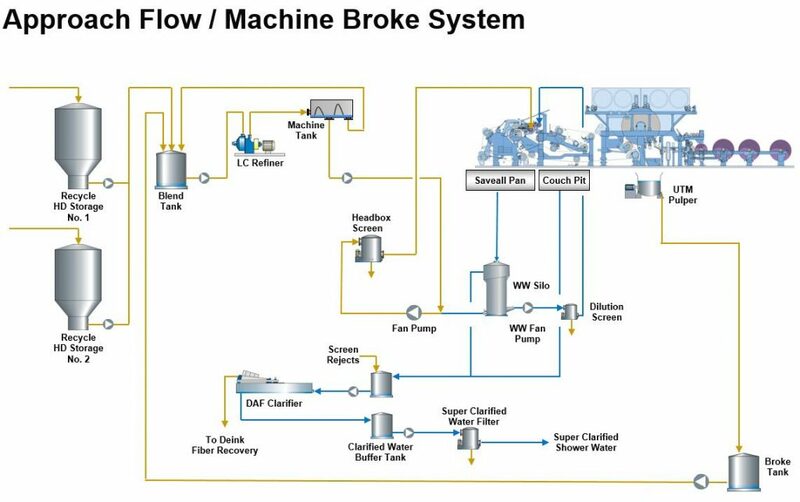 Fiber Recovery: Pressure Screens, Side-Hill Screens, and Flotation Cells are often used to recover long fiber from various waste and filtrate streams to enhance overall system yield. 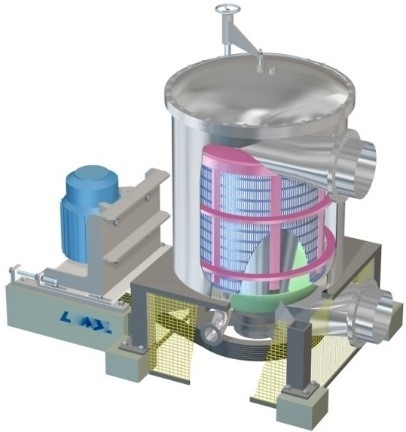 Contaminant/Debris Handling: Reject Collection Screws/Separators, Compactors, Piston/Ram Presses and similar devices may be used for collecting and processing and thickening various debris streams. Blending: A consistent stock blend is critical to producing a uniform and consistent product with repeatable strength, softness, basis weight and bulk. The consistency and flow of each component furnish stream must be measured and controlled in its delivery to the blend chest in order to maintain consistent furnish proportions for each grade produced. A tissue machine may have several different furnishes to blend together, with different compositions and proportions for the individual layers of the sheet. A typical blend system might possibly receive fiber grades such as Softwood, Hardwood, OCC, Deink Pulp, Eucalyptus, PM Broke, and Converting Broke – each from a different chest or system. A modern tissue machine blending system utilizes small volume blend chests to allow for rapid furnish adjustments to bring production to the desired grade and basis weight as quickly as possible, minimizing off-grade production. Large blend chests require more time to reach equilibrium which, in turn, produces more off-grade product during the transition. The DCS collects all of the furnish and dilution water flows and consistencies into and out of the blend chest and adjusts the flows to maintain constant stock proportions by weight and a constant stock delivery to each headbox fan pump on the machine. 1. The dilution water for consistency control is now added in a mixing manifold along with the each furnish delivered to the blend chest. This pre-mixes the furnish ahead of the blend chest. 2. The blend chest retention time is reduced to approx. 3 minutes to help reach process equilibrium as quickly as possible. 3. Basis weight flow to each headbox fan pump is controlled using a variable speed pump with an injection nozzle to optimize mixing in the fan pump suction for uniform consistency in the headbox. A V-port ball valve is used to provide back pressure and allow the stock pump to operate near the mid-range of its pump curve. Strength: Strength is developed primarily through refining. Most of strength is normally developed by refining longer stronger softwood and recycled OCC fibers. Long fiber refining typically uses moderate intensity refiner plates with wider bar widths to develop fiber strength without cutting the fiber and generating fines. Dry and wet strength additives are also added in the approach flow loop to achieve the desired strength characteristics for towel and facial grades. Short fibers, such as hardwoods like Eucalyptus and deink pulp, are usually not refined to a great extent in order to minimize fines generation, which affects drainage, formation, bulk and softness. Refining short fibers requires low intensity refining with narrower bars and grooves to develop fibrillation and strength, while minimizing fines generation. It is important to select refiners and refiner plates to meet the production requirements with the optimal plate patterns for the furnish being refined. The best fiber development is achieved using refiners and plates optimized for the particular furnish and production rate required. Separate furnish refining requires that the individual furnishes be refined ahead of the blend chest. 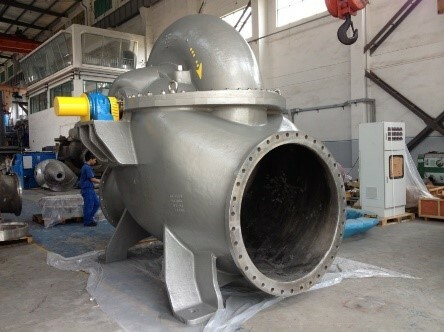 The approach flow system starts with the thick stock entering the fan pump for delivery to the tissue machine. The tissue machine, as we know, is producing a very low basis weight sheet, and to distribute these fibers evenly across the machine, the consistency going into the headbox ranges between 0.12-0.20% solids. The fan pumps are specifically designed to deliver the stock suspension to the headbox with minimal pulsation and variation in operating pressure. The fan pumps and headbox approach piping is normally supplied with polished stainless-steel surfaces to prevent buildup of contaminants within the system. The headbox and machine fabrics are protected from larger contaminants that might enter the approach flow system by a pressure screen for each ply on the machine, and also the headbox trim dilution pump. For machines fed solely by market pulp, these pressure screens operate with 1.6-2.0 mm diameter holes to prevent debris from reaching the machine. Often these screens operate using a manual reject operation, with dumping of accumulated debris from the screen done during Yankee doctor blade changes and reel turn-ups. On recycled-fiber tissue machines, slotted screen baskets have slots ranging from 0.20-0.35 mm that remove any smaller contaminants, plastics, stickies and dirt that might reach the machine. Since they normally have higher debris content and reject rates, slotted headbox screen systems usually have secondary and tertiary stage screens to maximize efficiency and fiber recovery. Broke systems on tissue machines are classified into two types – On-Machine or Off-Machine. On-Machine broke systems consist of the under the machine (UTM) broke pulper, a broke storage chest, high density (HD) cleaner or protection screen, deflaker and fine broke screen. The under-machine pulper collects and repulps the trimmed edges of the sheet, as well as any production that drops off along the machine run, from the Yankee until the sheet is delivered to the reel and wound on the reel. Slabbed broke is also often fed to the UTM pulper and pumped to the broke chest. Slushed broke pulp is stored in the broke chest and metered back into the blend system as needed as a portion of the total furnish blend. Because the broke has already been refined and formed into a sheet, and may have been treated with wet or dry strength chemicals, or accumulated debris from off the machine, the pulp must be prepared for reuse. Typically the broke pulp is pumped from the broke storage chest and passes through either a barrier screen with 4-6 mm holes or a high density cleaner to remove large contaminants that might damage the deflaker. The cleaned stock then passes through one or more deflakers, depending upon the wet-strength dosage used on the machine. Machine broke is typically not fully cured and the strength additives are not as difficult to repulp as fully cured converting broke. The deflaked stock is then screened with 0.2-0.25 mm slots to return any remaining flakes back to the deflaker feed pump for additional processing. Fig 7. On-Machine Broke System. Off-Machine broke, because it is usually fully cured by the time it is returned for repulping, requires significantly more energy to recover good fiber. With heavy wet-strength towel, batch times might approach 60 minutes of pulping time. Low consistency pulpers can operate at up to 7% consistency. High consistency pulpers can repulp converting broke at up to 15-18% consistency. Pulping at higher consistency requires a larger motor and higher specific energy, but pulping at the higher consistency also tends to reduce fines generation and steam consumption. Higher pulping temperature and/or the use of chemicals can help reduce the required pulping time but, at the same time, residual chemicals in the system may upset the chemistry on the tissue machine. At typical off-machine broke system consists of a pulper feed conveyor to feed loose broke sheets and dewired broke bales. This broke may include undesirable items such as plastic wrap, adhesives, broken bale straps or wires, tissue and towel roll cores, and loose trash collected from the converting area. Because of the significant amount of trash like this that may be included in off machine broke, a barrier screen with large holes is advantageous to remove the trash ahead of the deflakers. Fig 8. Off Machine Broke System. For heavy wet-strength broke, up to three deflakers might be required to disintegrate the flakes. A slotted screen with 0.20-0.25mm slots would remove any remaining flakes and return them to the deflaker feed pump. High consistency (25-30%) dispersion systems like those used in deinking systems can also be used for disintegrating wet-strength broke. This requires significantly higher capital and operating expense, but it provides the opportunity to bleach the broke prior to being returned to the tissue machine. This can address treatment of dyed broke and have some impact on brown core stock. Fig 9. Fine Slotted Broke Screen.